You are here: Home / Technical / My First WordCamp! Je vais à Montréal pour WordCamp Montréal. WordCamp est un festival pour gens qui utilisent WordPress. Je vais assister à des conférences. Je me porterai volontaire à la “Happiness Bar” le dimanche. Whew. I’ve worn out my French (feel free to correct it!). 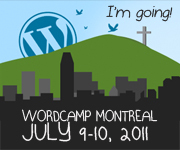 I’m going to WordCamp Montreal July 9th and 10th and I’m really excited! I’ve never been to a WordCamp before (which is my excuse for why I’m not volunteering to give a presentation). For those of you who read Ipstenu.Code, it’s no secret I’m fond of WordPress. It’s a product that has taught me more about relational databases, code management systems, SEO, and everything else internetty than anything else. I won free tickets to the WordCamp, I got plane tickets for about $100 for me and the Mrs, and I’m dovetailing my trip to Montreal with my Mom’s, so she can show me where she grew up. In short, I’m really excited/nervous/giddy/scared about all this.